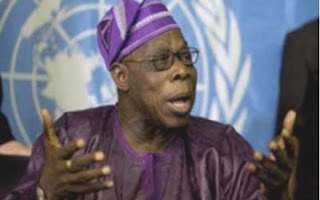 Former President Olusegun Obasanjo on Monday in Abuja told former Vice-President Alex Ekwueme that he was already close to the departure lounge. Obasanjo said this while congratulating the former vice-president on his 80th birthday. By becoming an octogenarian, Obasanjo said Ekwueme should know he was becoming an old man. Friends and well-wishers had elaborately marked Ekwueme’s birthday in Abuja and other major cities in the country. Obasanjo spoke at the conference on Party Politics in Nigeria and Lobbying, the Lobbyist and the Legislature, organised by the National Institute for Legislative Studies. Before Obasanjo spoke, Senate President, David Mark; his Deputy Ike Ekweremadu, and the Deputy Speaker of House of Representatives, Emeka Ihedioha, had congratulated Ekwueme on attaining 80. Obasanjo, who shared one of the sessions of the conference, later told Ekwueme that attaining 80 was a sign that he (Ekwueme) was moving to the departure lounge. Obasanjo said, “The only octogenarian on the high table, and I don’t think there is even another person on the other side of the table, even in the hall (that is up to 80 years). “My brother and friend, and I think the Senate President regards you as a true democrat; I will join the others in congratulating you on your recent crossing of the bar. “But let me just warn you that crossing the bar or becoming 80 something, you are getting nearer the departure lounge. His comments elicited laughter from the audience, including Ekwueme, who in a hushed tone, spoke with Obasanjo. No one, however, heard what Ekwueme told the former president. But Obasanjo replied him in pidgin, “As we come, na so we go go,” which literally means that those who came to the world first would be the first to die. While Obasanjo was born on March 5, 1937, Ekwueme was born on October 21, 1932.